Fashion tips for recovering from an ankle surgery or ankle injury. We’ve created greats fashion styles for dressing with a medical boot. Our covers will help keep your injured foot warm and dry while you recover. What a glorious day! The sun is shining and it’s a perfect Autumn day. Enjoy! I love Autumn and wandering around the garden watching the colors change almost daily, cup of coffee in hand, camera around my neck. The colors aren’t quite in full-on mode quite yet, but there is plenty of Autumn color to enjoy. And enjoy, I shall! The first day of Autumn means Snygg Boot cover season! Our Snygg boot covers your medical boot or orthopedic boot to keep your foot warm and dry. Look great and feel comfortable in a warm boot cover while you recover from your ankle injury! Flaunt Boots can help keep you looking great this fall, as well as keep your injured foot warm and dry this season. 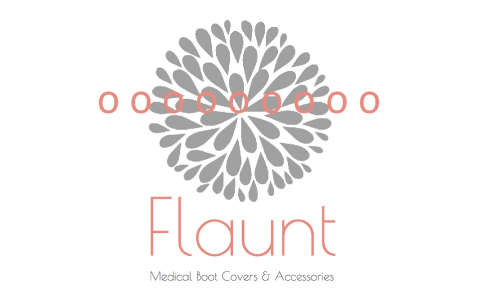 Cover your medical boot after an injury with a fashionable cover by Flaunt.